A pure all natural oil with no additives. Rice bran is one of the only few natural sources for the newly discovered vitamin E complex called tocotrienols. Tocotrienols are powerful antioxidants that protect the body from damaging free radicals. 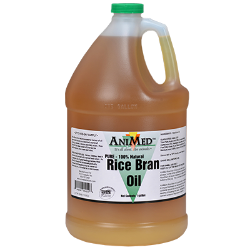 AniMed’s Rice Bran Oil is recommended for horses of all classes as a balanced source of energy, calories, vitamins, and fatty acids. One gallon of Rice Bran Oil is equivalent to 40 pounds of rice bran. Feeding four ounces per day, one gallon will last up to 32 days.